The Honda Ridgeline is a mid-size truck that appeals to brand buyers who couldn't care less about cowboy-themed luxobarges. The pickup has a dirty secret: it's related to the Honda Pilot crossover and Honda Odyssey minivan. With the Ridgeline, Honda has the only unibody pickup truck you can buy. 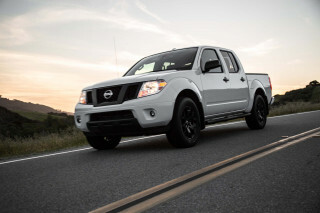 It's also the only truck to offer front-wheel drive, though all-wheel drive is available. The Ridgeline's roots come with a compromise. The Ridgeline boasts a spacious cabin, made better with good creature comforts, but ultimately runs out of room in the bed—it's smaller than the competition. The Ridgeline's interior is not only more spacious, but better appointed than the cabins of its mid-size competitors, which include the Chevrolet Colorado, GMC Canyon, Nissan Frontier, and Toyota Tacoma. 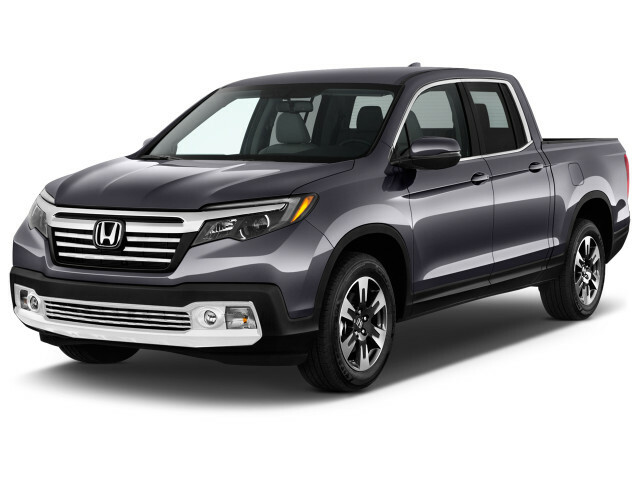 Honda left the Ridgeline unchanged as it moved from the 2018 to the 2019 model year. Now in its second generation, the Ridgeline takes on a more traditional pickup look, with a bed that appears to be separate thanks to body cutlines that are cosmetic. The sail panels that made the Pilot look like a combination of a pickup and an SUV are gone. The design also includes a crew cab body style, a grille that plays off the current corporate face, and somewhat softer lines than the competition. The bed is shorter but wider than those of most mid-size pickups. At 5-feet wide and with 50 inches between the wheel arches, it can allow 4-by-8 sheets of plywood or drywall to lay flat with the tailgate opened. At 5-feet-4-inches long, it is a bit longer than before but about 10 inches shorter than the longest beds offered by the competition. The new bed has some features that the competitors can't match. 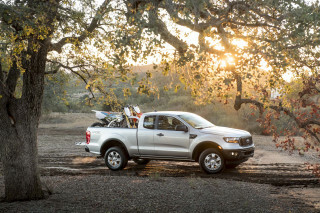 It retains the in-bed trunk and dual-action tailgate from the previous model. The tailgate is hinged both at the bottom like a traditional tailgate and along its left side so it can open like a door. Located under the bed at the rear, the trunk has a flat bottom and adds a drain plug. Honda also provides eight 350-pound tie-down cleats. The bed is also available with the industry's first in-bed audio system with six "exciters" in place of speakers. Offered as an accessory for the bed is a 400-watt AC power inverter to charge tools or plug-in your favorite tailgating entertainment. Honda says the Ridgeline can carry up to 1,584 pounds in its bed and tow as much as 5,000 pounds on top of carrying two passengers and 100 pounds of gear. By comparison, the Chevrolet Colorado can haul up to 1,570 pounds of payload and tow up to 7,000 pounds. The new Ridgeline is powered by a direct-injected 3.5-liter V-6 with 280 hp and 262 lb-ft of torque. Honda also offers an Intelligent Terrain Management system with Normal, Sand, Snow, and Mud modes. Inside, leather upholstery is offered, and so are tri-zone automatic climate control, keyless ignition, a color meter display in the instrument cluster, an 8.0-inch Display Audio system with Apple Car Play and Android Auto, and a 540-watt audio system. We agree with Honda's claim that the Ridgeline has the quietest cabin in its class. Like the last-generation Ridgeline, the new truck delivers Honda's typical smooth powertrain performance, and class-leading ride and handling. Inside, it features a multitude of stowage options, including space under the rear seat. The rear seat bottoms fold up in a 60/40 split to open up even more storage space. The Ridgeline has achieved top crash test ratings, including a Top Safety Pick rating from the IIHS, and it offers plenty of safety features, though only on the two top models. The Honda Sensing suite consists of forward collision warnings with automatic emergency braking, road-departure mitigation, blind-spot monitors with rear cross-traffic alerts, lane-departure warnings, active lane control, adaptive cruise control, adaptive high beams, and front and rear parking sensors. A multi-angle rearview camera is standard on most trims, and the Honda LaneWatch system with a side-view camera activated by the right turn signal comes on a lesser trim. Honda introduced the Ridgeline as a 2006 model. While it was named the 2006 North American Truck of the Year, the odd-looking truck was never a smash hit for the brand. Instead, like the Ford Ranchero, Chevrolet El Camino, and Subaru Baja near-trucks before it, the Ridgeline built a small, but fervent, fan base. The first generation's strange design could have been explained by sail panels at the front of the bed to give it strength. 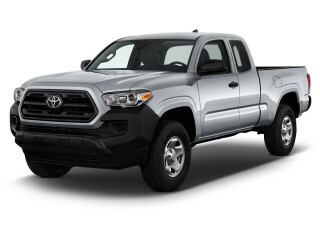 Over the years, styling updates for that model were mostly limited to a new grille for the 2010 model year that borrowed from the trucky looking refresh of the Honda Pilot crossover. The unusual pickup bed limited the Ridgeline's utility, though Honda explained that its pickup wasn't intended to be a full-size truck, but one useful to owners of its other motorized products. At just over 5-feet long, the composite bed wasn't big, but it could hold a 4-by-8 sheet of plywood with the tailgate down. An optional bed extender included more tie-downs and could handle mounting accessories for ATVs, snowboards, surfboards, bikes, and the like. Still, heavy-duty towing components were included, and the Ridgeline could tow up to 5,000 pounds, or haul a 1,550-pound payload. The under-bed cargo bin could only be accessed when the bed was empty, of course—but the Ridgeline's tailgate both flipped down and swung to the side on a hinge, making it more flexible in that respect than any other pickup. Unusually for pickup trucks, the first-generation Ridgeline only ever offered one single engine and transmission. The 250-horsepower, 3.5-liter V-6 engine, paired to a 5-speed automatic transmission, gave the Ridgeline brisk acceleration and good passing response, even when loaded. The Variable Torque Management four-wheel-drive system made the Ridgeline better suited for slippery snow-covered roads than most four-wheel-drive trucks. Both ride quality and steering feel were better than most full-size and mid-size trucks, too. What the Ridgeline lacked in utility it more than made up for in safety. Honda's truck was named a Top Safety Pick by the IIHS, with top "Good" ratings across the board. It also offered a slew of airbags (front side, rollover-sensing side curtains for both rows) as well as stability control and anti-lock brakes on all models. Honda needs to hire a design team and build an attractive appliance for once. Waiting for the roomier/longer 2019 Ridgeline. Does all I need and feels lake a car. I do oil and gas consulting in tuff hard to reach locations in wet and dry weather. I have had 6 ridge lines and drove them 70000 mile each with no problems.